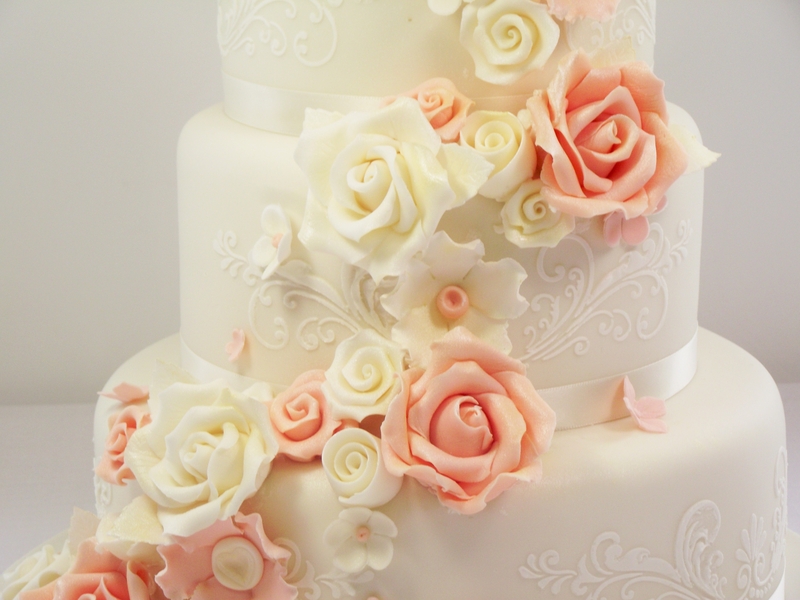 Valerie contacted Cake Rise about booking her Wedding Cake towards the end of 2014. 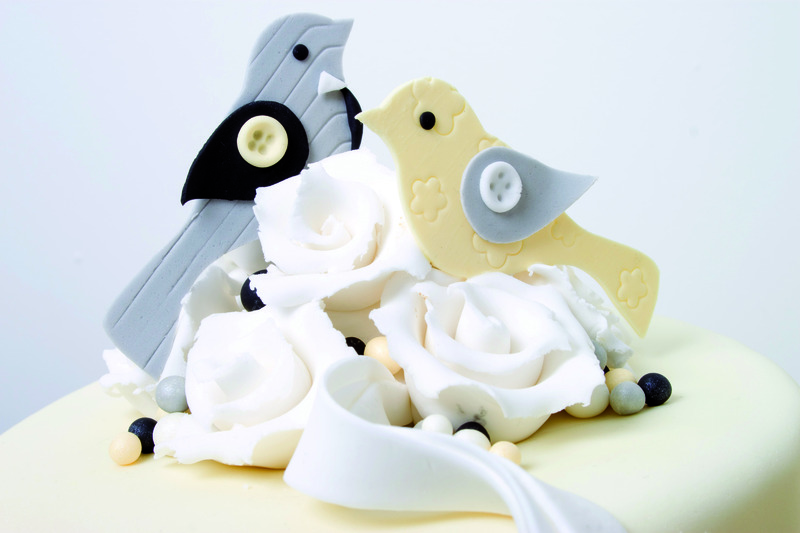 Her Brother & Sister-in-Law had used us a number of years earlier for their Wedding Cake. 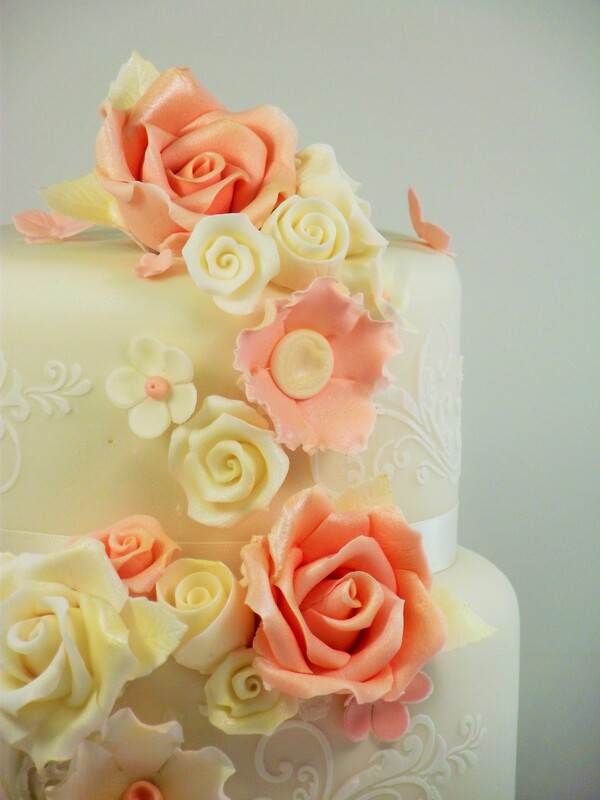 A Wedding Cake consultation was booked for January 10th 2015, Valerie knew exactly what she liked and it didn’t take her long to decide on a previous Wedding cake of ours as her inspiration. 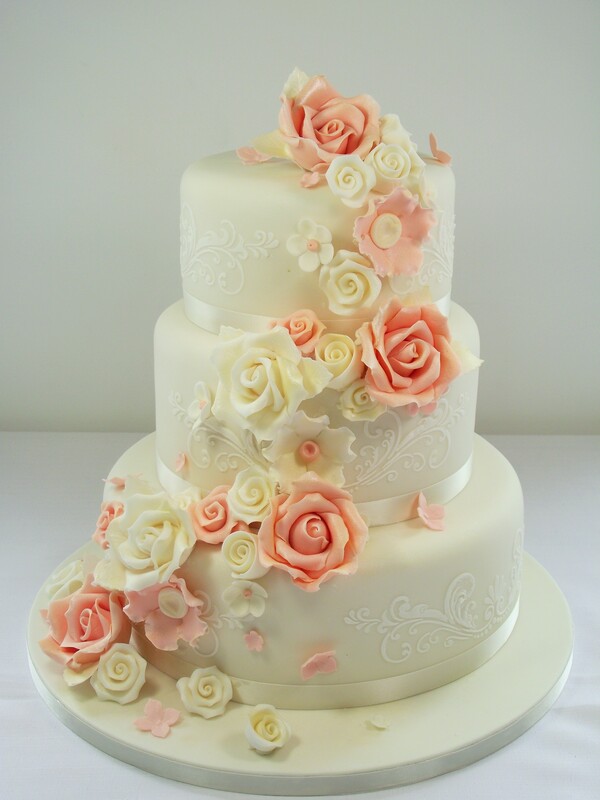 A three tier round ivory cake design was chosen, decoration cascading ivory & pink large sugar roses with additional smaller roses & blossom flowers, finally elegant stencilling around the sides of the tiers. Valerie opted to have three different flavours using Chocolate Biscuit, Red Velvet and Fruit cake. 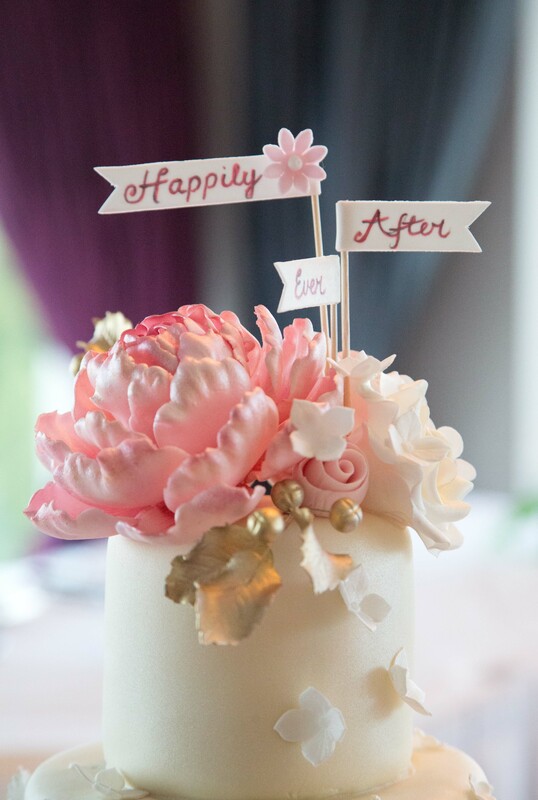 As one of Valerie & Darragh’s flavours was a fruit tier, work began on their Wedding Cake some weeks before their Big Day to allow the fruit tier time to mature. 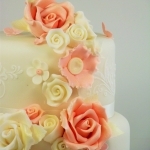 Their Chocolate Biscuit & Red Velvet tiers would be baked only a few days before their Wedding. 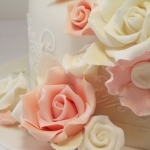 With the week of their Wedding already upon us the pressure is on to make all the handmade sugar flowers required (and a few extra in case of any breakages), baking their Chocolate Biscuit & Red Velvet tiers so they are as fresh as possible. 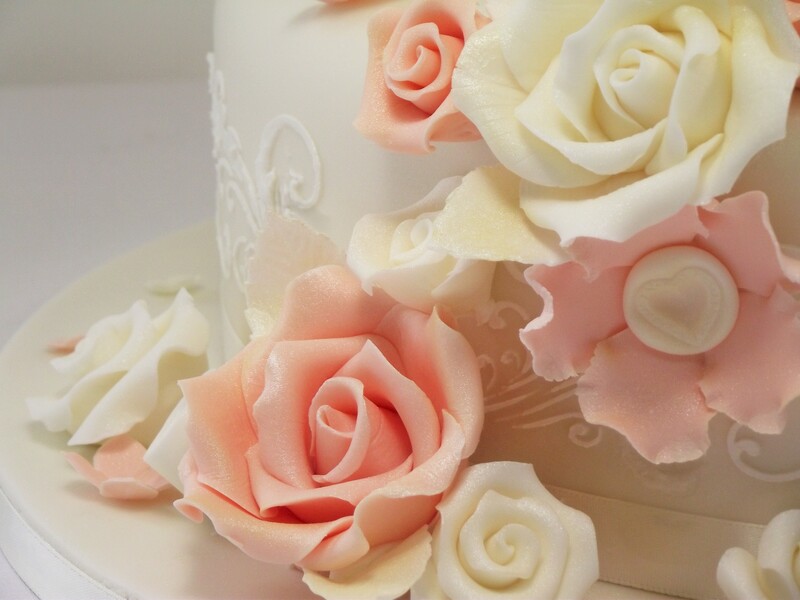 All three tiers need to be covered with almond icing then fondant to achieve a lovely smooth finish. Once they are dry the tricky process of placing all the sugar flowers can take place, a lot of time, skill and patience is required for this part but is always worth the effort. A few final touches and their Wedding Cake is ready to be boxed for delivery to Kilronan Castle on the morning of their Wedding. Always a nerve wrecking journey with a Wedding cake on board. Valerie & Darraghs was none the less uneventful, heart in mouth, thankfully 30 minutes later we arrive safely at Kilronan Castle. Once set-up in the beautiful function room, relief, joy and a great sense of achievement, phew……..
Wishing Valerie & Darragh all the best for their future. 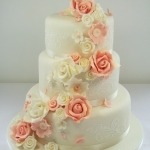 Thank-you for choosing Cake Rise to make your Wedding Cake.